In my previous article, I wrote an overview of Australian economy. This article is to explain the international trades performed by Australia. For the extended fundamental analysis of Australian Dollar, international trades e.g. export and import activities must be studies. Exports represents 23% of total Australian economic output. According to the statistics in 2012, Australia exported $258.8 billion and imported $239.7 billion. Australia's top ten exports are accounted for 80.1% of the overall value of its global shipments.Following table illustrates the Australia's top ten exported goods and services. If the monetary policy is a wing to the fundamental analysis of Australian dollar, trade balance is another wing. Trade balance plays vital role in the fundamental of Australian dollar. 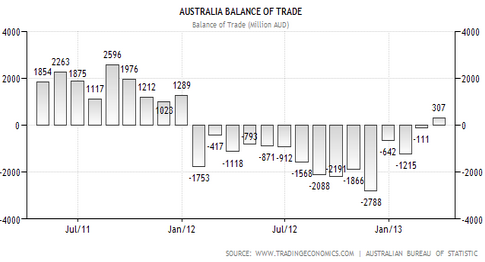 Above image shows the historical data of Australian trade balance. Australian economy is an export oriented economy, which was driven fast by the mining sector in the recent history after the economic recession in Australia. From the above table, we can see Australia's top five exported products are from mining sector. A hike in the price of Iron Ore, Coal Briquettes, Petroleum Gas and other exported products will increase the value of Australian dollar. Australia mainly imports oil and oil related products, that is why a hike in the oil and oil related products negatively affect the Australian dollar. Above image illustrates the list of Australia's top five export destination and import origins. All of this economies have significant effect on the Australian dollars. For example, if the Chinese economy passing a booming phase, the demand for the products exported by Australia will be increased hence the demand for Australian dollar. Studying the international trade by Australia is crucial for the fundamental analysis of Australian dollar, which is greatly affected by the economy of import and export partners. This post is just an overview of the international trade by Australia, far study on the international trade by Australia is required. The data presented in the post is the historical data, and economy of a country is completely dynamic. So, consistent study on the international trade by Australia is necessary for the successful fundamental analysis of Australian dollar. If you have any question you can drop a comment below. The foreign exchange market is worth billions of dollars. It is the only market that remains active round the clock, with currencies being traded back and forth at all times. Now, most traders follow different types of strategies while trading on the forex market. Some believe in a more aggressive approach and use trading styles such as swing trading in order to generate more profits. On the other hand, other traders often take a long term approach, holding currency pairs for several days in the hope of generating a bigger profit.